I hope this finds you feeling well! I'm not even going to talk about the weather. Maybe if we don't give Mother Nature any more press, she'll just settle down, have a drinkie poo, and take a look at the calendar! Today I have a coupla Quick And Clean And Simple cards. I mean, uberly so! I know I should've done a video, because this explanation might get too complicated with words, but do your best. You take a piece of white card and fold it over, lay a stencil over it (this one from Tim), hold it down with removable tape, and pounce a pretty color through the holes using a stippling brush. You can do it! For this card I used chalks from SU. Remember those? I added a vertical sediment from Stamps By Judith and two score lines and, wallah, a birthday card for any age! 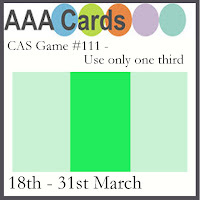 AAA Cards: Use only one third. Less Is More: OLC Stencils. That was so easy, I switched to a snowflake stencil from Loll for a Christmas card, only this time I used Doxies. The sediment is from MFT. You might have noticed that you don't see a lot of beautifully ink-blended designs from me. What can I say? It's just something my inks don't do. I have tried to make them blend. Lord knows I've tried. I've had lessons. I've watched experts with awe. I've even tried cheating and using Hammy's fur. Then his nose. Then his paws. I wish you could have seen how pretty he looked, but the cards, not so much. But I digress. Anyway, since I was pouncing and not blending, I tried using inks. The coverage wasn't as great as with the chalks, but I think that's okay because snowy wintry skies are a bit fuzzy, aren't they? Oh, sorry, we weren't going to talk about the snow. Sorry. With her permission, I wanted to share that our beloved daughter-in-law Rachel (mom to the grandtwins) was diagnosed with breast cancer recently. She has had a lumpectomy and the prognosis is very positive because her cancer was caught early with a mammogram. We don't know the full extent of her treatment plan, but we do believe she will be fine and we're very relieved and grateful. I am sharing Rachel's story to remind you how important and life-saving mammograms can be. Rachel is only 45. She had her first mammogram two years ago and it came back clean. She recently received a letter from the clinic telling her that the protocol for her age is to wait five more years before having another one. Thankfully, Rachel's intuition told her to go ahead and get a mammogram anyway. The tumor was deep and would not have been discovered with a self-exam. I know having mammograms for women under the age of 50 is controversial, but we shudder to think how advanced Rachel's cancer would have been had she waited five more years! You're all dear to me, so if you've been neglecting getting your mammogram, make that appointment today, especially if you are over 50. I have neglected getting my own, but now I have an appointment next month. Love these, Darnell! You've reminded me I need to use my stencils--so effective with chalk or ink! Such good news that Rachel's cancer was caught early & you're so right about how important it is that we all get our mammograms! Glad you scheduled yours, my friend! Fabulous cards Darnell ... versatile designs beautifully created. Trusting our instincts are so important when it comes to our own health. Best wishes to Rachel. Gorgeous cards Darnell - love your poncing with the chalks - had not thought to use my chalks like that, thanks for the inspiration :-). I had my Breast Scream (mammogram) last year (we have free ones every two years from 45 - 75 now) and then found some lumps a matter of months later. I Had an ultra sound scan within 4 weeks and it was nothing to be concerned about! Whew! Fabulous cards Darnell - I must do more stencilling too. Glad to hear Rachel is okay and that you've made an appointment to have your boobies squished! Gorgeous stenciled designs Loll, love those snowflakes. Two fab stenciled cards, pounced or blended, who cares. Two beautiful CAS cards Darnell, I love them both. Hi Darnell, Cards are lovely. Sending heaps of positive healing thoughts to Rachel. Two fantabulous makes and I love them both. Thanks for the easy to follow instructions on making your two QACAS cards. They're fabulous and easy + fast = awesome! I'm so happy that Rachel's breast cancer was detected early and I pray for full recovery for her. Thanks for the timely reminder about the importance of having mammograms. Two delightful cards shared and an all too important message as well. Thank you so much for reminding us to get checked what needs to be checked. I've gotten a mammogram every single year since I was 40. I get a reminder in the mail and not once have they said to skip any years. I'm so relieved to hear your dear daughter-in-law will be fine. Good luck to all as you navigate the process. Hugs to you all! Cute cards!! Glad to hear Rachel is OK! That reminds me that I have to go get mine done soon. My doctor sent the order in last week. You've done two perfect cards using stencils. I like them both. Thank you for sharing an advice about mammographie. We all have to think of ourselves first. I'm sending best wishes to your daughter in law. I love the simplicity of both cards. I always recognize Judith's stamps. If you use Hammy again to try and blend please take and post a picture. I am so glad Rachel's cancer was caught early and her outlook is so positive. I think the cartoon is an excellent way to remind us about mammograms. And not talking about snow isn't going to help here. We have a possibility of up to five inches tomorrow. Good crafting Saturday. You're right, the instructions were grueling but I'll give it a try anyway. Until Oxide inks blending for me was a nightmare and most projects ended up in the round file, so I fully aware of what you mean. Great reminder of breast health and the need for diligence with mammographies. So happy the Rachel's lumpectomy is over and the diagnosis is good. Fabulous cards Darnell,and I am glad you were able to share Rachels story. Continuing prayers. Your cards are beautiful plus!!! CAS and sensational just like always. Still sending prayers for Rachael and everyone in the family. Yes, it's very, very, very important to have that yearly mammogram. Fabulous cards and I love your very complicated instructions on how they were achieved! LOL! Best wishes to your DIL, good on her for being brave enough to follow her instincts. Thanks for playing along with AAA Cards. Hmmm... I've never tried stippling chalks before. It sure turned out pretty! I still like to use my chalks now and then. I like both backgrounds and so easy to turn out beautiful CAS cards. That's a frightening story about Rachel, but good that she followed her instincts. 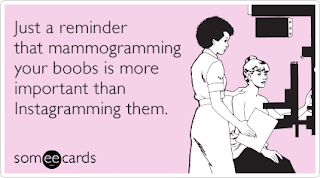 I have regular mammograms, usually in October, which is breast cancer awareness month and easy to remember. Plus my doctor sends me a reminder. I'm really glad you posted this, Darnell. Lovely cards! So glad they found the cancer now and how happy to hear she went ahead and got checked instead of waiting 5 years. Sending lots of prayers and hugs as she goes through whatever treatment and plans they have for her. Thanks for posting this! Hugs! Best wishes to Rachel and the whole family as you face the coming months. I hope you find comfort and strength in each other and those around you. Sending prayers for effective and minimally impactful treatment. BTW, wonderful cards and the blending is lovely! I too love your cards. Wonder where my chalks are...lol. Thanks for the reminder to get my mammogram. I've been lax. Special thoughts and good wishes to Rachel and for you. Hugs to you, Darnell. 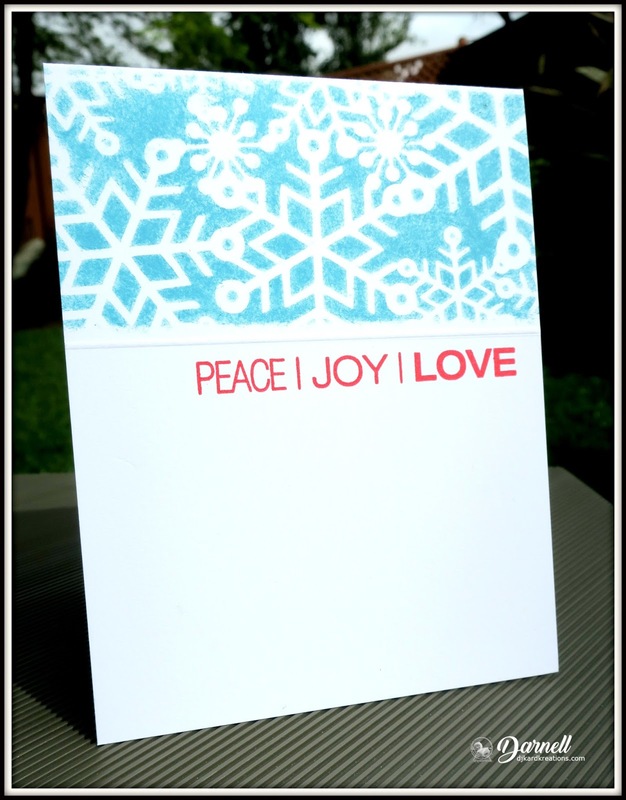 Love your quick cards with that stenciling, very nice. Prayers for your daughter-in-law. Thankful she did have the mammogram and caught it early. Oh Darnell I can't think of a more frightening sentence than "you have cancer" I will keep Rachel in my prayers and thank the Lord He is on the move!! Two super cards. So that's where my number stencil was hiding!! Just knew it would turn up somewhere. Hugs Mrs A.
Hi Darnell, Came by for some crafty inspiration, but was so surprised to read the news about Rachel. Sending hugs and thoughts and prayers. So sorry to hear about Rachel's cancer but thank the Lord she went and got a mammogram earlier then they said to do. It sounds like it was caught in time before it had a chance to spread too far. But for the cards you did with stencils. I love them. Clean and simple but still very effective with artistic flair. Hey! I think I could even do some with stencils this way too. And, don't worry about the blending as they look great with just one color. Now let's hope we start getting sunshine more and more after this week. I won't give that other four letter word any publicity! Your stenciled cards are so pretty and I love the CAS design of both! So glad your DIL listened to her intuition and followed up on it! I'm glad to know she's on her way to a complete recovery of good health! I love the simplicity of your pretty cards! The shade of blue is wonderful! Continued prayers for Rachel and good to hear she followed her instincts to go ahead with that mammogram. Love your CAS cards! I bet hammy looked adorable all Inked up! LOL! Bristol smooth card stock is perfection for ink blending! Thank the Lord that your DIL found trusted her gut and it was found early! Sending many prayers for her and quick recovery too! Hugs! Hammy is such a good sport letting you try ink blending with his various body parts! I don't think the spaniels would put up with that, though their ears might be quite effective! Two lovely CAS cards, especially the snowflake one! And a great reminder to all of us to get those mammograms done regularly. Wishing Rachel a full and speedy recovery. I was 41 when I Had my first mammogram and first cancer diagnosis. The doctor scrutinized the films with a magnifying glass and found calcifications. I had a lumpectomy and radiation. Three years later, the same doctor found more calcifications , this time resulting in a mastectomy. That was 20 years ago. Get those mammograms!!! It is a small discomfort compared to the alternative. If you have a family history get them more often. Luckily my daughters doctor understood our history and started her at age 30. Your cards are both great! I love the look of stenciled images. Thanks for the mammogram reminder. I actually just had one done - and all is ok.
Well you surely can do more stenciled blended ink cards for me - talk about easy but love them both. Will keep Rachel in my heart and prayers - and for her trusting her own gut feeling. Keep us updated. Sometimes less is more and that is certainly the case with these 2. Glad you decided to share Rachel's story with everyone as it may hopefully prompt someone into having an overdue check done. I had my first last year (they have lowered the age in the UK) and wouldn't hesitate to have it done again as it was a quick and easy procedure. Rachel and The Knauss Posse will continue in my prayers. You are too hard with you, Darnell ! Your ink blending is gorgeous and your two stencilled cards are beautiful ! I love your design on the first one, such a lovely dimension with the two score lines for a OLC card ! Thanks so much for sharing and for playing along at Less is More. I can't sponge ink evenly to at all! I'll have to try stippling! I do have brushes and I think my last escapade with sponging was done with the brushes and worked so much better than sponge in any way shape or form! The birthday card is perfect for anybody of any age or interest! Love that! And the snowflakes are so pretty on that soft blue! I have my mamo appointment set for next month. I get my appointment when I get the photo op and make sure I keep it. The new 3D mamograms are awesome and I think not as uncomfortable. Definitely worth the few minutes it takes! Wonderful news Darnell and wonderful cards too!! Oops, I meant to add that my prayers are with Rachel as she chooses treatment and fights this dreaded disease. Oh, these are so lovely, Darnell! And thanks for the inspiration and encouragement to give more love to our stencils. So sorry to hear about your daughter but thankfully it was caught early. I agree about the importance of mammograms. Best of luck to her in deciding on the best treatment plan. Thankfully there are so many better options today. Two lovely cards. I found some chalks on a recent tidy of my craft space. All the best for your daughter in law. Great cards, Darnell. They are so beautiful in their simplicity. I tend to use chalks only to dust on paper when I don't want a stark white background. I should use mine more. I am thankful that Rachael's cancer was caught so early. Love the stenciling Darnell, a technique I forget all too often. I am so sorry to hear about your daughter-in-law, I will keep her in my prayers and yes early detection is the key here. Hello, Darnell... long time (and I mean looong time) no see! I don't even know where to start. Your cards are two great twofers. Personally I love that Tim stencil. Maybe with a little more "break dance", Hammy might help you with ink blending. Have you tried the new oxide inks on watercolor paper? They are supposed to work well together... hope this helps, although you've probably tried them already. I'm so sorry to hear that your daughter-in-law had breast cancer. Fortunately it was diagnosed at an early stage, and she was wise. I was really surprised with the letter from the clinic. I have mammograms since my early 30s (when my mother was firstly diagnosed) every year. Maybe it helped the fact that there was other cases in my family, but still, five years is way too much without having one. For what it's worth, some type of cancers aren't even detected with a self-exam, only by mammogram. Ask me how I know. I never had a lump, but I had breast cancer caused by a cluster of micro-calcifications. It's rare, but happens. I finally made it! I think I am more or less up to date now after my few days away! Both cards are beautiful Darnell and even though you don't get on with blending, your pouncing is superb, both cards look fabulous! You know already how I feel about Rachel, I am just so thankful that it was caught early, that was so intuitive of her to go for the check up. I am keeping her (and you) in my thoughts and have my fingers crossed that all goes well going forward. Two fantastic QACAS cards Dolly! Your pouncing with a stippling brush has created two beautiful cards! Great job! Love both your one layer cards - must try using chalks with stencils. Thanks for reminding me about these! Your QACAS cards are fabulous, Darnell! Thanks for sharing Rachel's story and reminding us all to get mammograms! So glad that Rachel listened to her intuition and the tumor was found early! Wishing her all the best for the rest of the treatment! Beautiful cards Darnell! I will add Rachel to my prayer list. Two great cards Darnell! So funny, I was only thinking about chalks the other day as I don't think I've used mine for a decade, funny how some things go out of fashion isn't it! Thanks for playing along with us at AAA Cards. I am so glad that Rachel took her intuition seriously and got a mammogram because catching these things early can make all the difference. How frightening for her and your family, but I'm sure she'll be getting the best of care. Hopefully the lumpectomy will take care of the cancer once and for all and she will be one of the very fortunate ones. Mammograms are one thing that I've always been on top of, especially after I had an irregularity several years ago that resulted in a lumpectomy as well. Mine turned out to be non-malignant, for which I am very very grateful. I'll be thinking of Rachel and wishing her the best. Thanks for reminding us all of the importance of making our health a top priority. I got sidetracked by the news about Rachel and forgot to say that I am tickled by your use of colored chalks and a stencil. I have TWO sets of chalks that haven't seen the light of day in years, but have never even thought to use them with stencils. Another technique to try before I leave this earth..oh my! The list grows every longer, which means I may have to live forever. Two fab card. The pouncing is beautifully done. I must dust of my chalks. Hadn't thought of them in ages. All the very best for your daughter-in-law. Beautiful stencilled cards! LOVE the CAS and colors! I get a mammogram every year. I hate the new recommendations for women's health about waiting longer in between all tests! Glad she listened to her gut and glad she caught it in time! Click through to see now the best stamping technique for colouring with pencils on coloured cardstock.